Get free license key for EaseUS Data Recovery Wizard and save $89.95. Giveaway powerful tool for recovering data on PC & Mac. Download the full software version to recover all lost data on the hard disk. The free offer EaseUS Data Recovery Wizard license key is 1-day giveaway. EaseUS Data Recovery Wizard Professional Edition support for recovering data on FAT, exFAT, NTFS/NTFS5 and EXT2/EXT3 file system. Any type of data supported including photos, work documents, articles, etc. The software available for Mac and Windows platform. On this giveaway EaseUS gave unlimited number free license key for EaseUS Data Recovery Wizard. To download the software with the activation code for free, visit following giveaway page. You must hurry because it 24-hours giveaway. 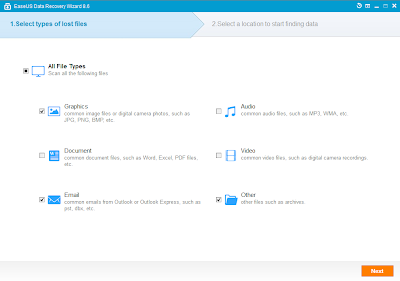 EaseUS Data Recovery Wizard Giveaway Page: Get the free offer! You must follow the steps below to download the software with the full license. Visit the giveaway page above. Fill the form by entering your name and valid email address. Click on “Get the FREE code” to submit. The license code will be sent to your email inbox after submitted the form. Download the installer and use key in your email to activate the tool. EaseUS Data Recovery Wizard can recover data on PC, Laptop, digital device, portable storage, and more. The tool offer quick & deep scan.